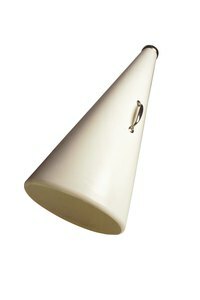 Megaphones are used at sporting events and in other situations where you need to make your voice louder to communicate with a crowd. Some are made electronically to create a louder effect. You can make your own mini-megaphone out of construction paper with a few simple tools that can be found at any craft store. Show your students and children how to make louder sounds by doing this fun and creative craft in the classroom, or use it at your next sports party to create an exciting atmosphere. Put the construction paper on a flat surface and smooth it out. Place a plate or other large round object near the center of the paper, and trace around it to create a large circle. Cut the circle out, then cut the circle equally in half to create two sides. Roll one of the halves into a cone shape, with one small and one large opening. Glue the two sides together and hold then until the glues is set. Once the glue is dry, decorate the megaphone with markers, paint and stickers.